I’ve exceeded 190 lbs in weight after working a few months of 70-80 weeks, with a few exceeding 90 hours. Those projects being completed, I think it is time to get back in the saddle, literally. Especially since my previous max is 185 lbs. I’ll have a hard time with even the CWD at that weight. With the choices being going to the gym, riding on my trainer, going for a run on ice and snow, or hitting the VAST trails on my bike, I chose the latter. I mounted my studded tires on my mountain bike and headed out, since I can connect to the trail network pretty easily. Riding on icy, crusty hardpack is usually pretty nice. And it was nice, as long as I was in the woods. The inch of new snow made the surface smooth and the crust underneath gave enough to provide traction. As long as i stayed out of the ruts, I was fine. But once in crossed Spear St and headed out into the open fields I was done. The ice under the snow was glare ice and the snow was deep enough to prevent my studs from gripping. I went down three times before deciding to turn around. I went down another two or three times on the way back, once going right over the handlebars when my front wheel broke through the ice. The picture above was taken just before I left the woods. Still, managed to not hurt myself and it was beautiful out. I’m hoping it will be like 2012? Why, 2012 was a miserable training year as work kept me out till January or February, but at least I was still able to finish American Zofingen long course (it wasn’t pretty). In 2009, I didn’t even bother to register. With 80-90 hour work weeks the norm lately and not likely to subside for at least a month; and my weight up to more than it has ever been, opting-down to the Canadian Women’s division is very likely. That might be fun, but still a shame since I just aged up. I am making a slow recovery from what my doctor says is mild hip bursitis, although at times it doesn’t feel mild – at least not when I’m active. I have been getting in about 5 hours if cycling each week and some minor strength training. I am not running and will be volunteering at the Adirondack Marathon on the 22 instead of racing. This seems to be the best approach. My the muscles throughout my left hip always seem to be on alert and ready to knot up at any moment, especially the gluteus minimus, periformis, and TFL. They are in need of constant massage or they seize up. Sitting around all day at work doesn’t help. I did manage a 2+ hour ride today in great Vermont fall weather. Those hip muscles were tight, but I took it very easy and focused on relaxing. I’m out of action for a little while, at least I hope it is just a little while. I’ve been suffering from hip pain for over a month now. At first I just thought it was muscle spasm or possibly a torn muscle, but after giving it a rest for about 3 weeks I went out for a short run and couldn’t even manage one mile before I had to walk home. I can ride my bike without pain, although my lip does feel tight. I see the Dr. tomorrow, but I’m hoping it is bursitis. The other possibility is a stress fracture. I’m gussing bursitis is the cause since the pain is on the outside of my hip and not internal. More info tomorrow. I want to thank all of you who generously contributed to this year’s Jim Ray Memorial Heart Ride. We’ve raised close to $7000 and are on our way to $10,000. Thanks! Most of us got up at 3 AM in order to be ready for a 4 AM start. That allows for final tweaks to the bike, some breakfast, and lots of warm coffee, which was particularly important given the cold rain that was forecast, and heated discussions about the route. We started out from Shelburne heading north on Rt 7 through Burlington (which caused much grumbling from me), Winooski and up to Milton, where we headed into the Islands. Stops, mostly to get rid of the coffee, were frequent but short. That’s one advantage of riding in a cold rain, you can’t just sit around for too long. The scariest part of the ride was the crossing of the drawbridge from S. Hero to N. Hero Island. This metal bridge is like ice when wet and although most of us were careful and riding fairly slowly, Mark decided to cut some ‘S’ turns to demonstrate his bike handling skills. He survived, and I must say I was extremely impressed with his ability to balance and steer a bike with zero friction between his wheels and the ground. The temperature never seemed to budge and sat at around 55 all morning. A bunch of us were suffering from cold fingers. Mine got so cold, I needed to use my whole hand to shift, and in order to squeeze gels out of the pouch, I needed to put it on my knee and squeeze it with my palms. My fingers just couldn’t generate enough force. Tim found a great coffee shop in Plattsburgh, where we took our first real break and where my fingers finally warmed up. Me, with Mark & Pepsi at the Koffee Kat in Plattsburg. When we got to Ausable Chasm our directions directed us over a now closed bridge. It took us a little while to find a way around, but at least we had another photo opportunity. To be honest, that bridge looked so rickety I can’t imagine cars every driving over it. The hills began to make their presence known at this point, which was sort of nice. There were also plenty of beautiful views East towards the lake, or what would have been beautiful views if the clouds and fog would have lifted for a little while. At around noon, we took a break at a sandy pullout on one of the lesser traveled roads we were on. Everybody’s cleats gunked up, especially Pepsi’s, who shortly thereafter attempted to stop, couldn’t unclip, and flopped over onto his side still clipped in. Fortunately, we were now on a dirt road and there were no cars around, only us amused witnesses. While on break, we were passed by some Randoneurs, who were riding the same route as us. They were obviously much more serious about their ride than we were – so much so that they couldn’t exert the effort to say more than a few words in conversation when we met up at a deli for lunch, which for us consisted of about 18 inches of submarine sandwich each. For anybody riding in NY, I have to say the roads are MUCH better than they are here in VT. Much of what we rode on was freshly paved. The only bad stretch is the part between Port Henry and the turn off to Crown Point. In addition to being in terrible condition, this narrow stretch of road attracts lots of truck traffic, is very hilly and windy, and has no rideable shoulder. Cyclists, take care. Once back in Vermont, most of us went on autopilot, having ridden this stretch of road many times before. It was hard, however, to maintain focus and ensure we kept up with the calories. On the Champlain Bridge – Back in VT. In the end, we rode about 180 miles (yes, Steve, I’m rounding up!) in about 14 hours. I’m not sure how much time we took on breaks, but it was both substantial and appropriate. So I tip my helmet to Mark, Steve, Tim, Sam, Pepsi, and especially Andy, who provided such great support! Next year it will be dry. It has always struck me how prominent the number 3 is in American Zofingen: 3 bike laps and 3 run laps (first one is warm up and doesn’t count). But it goes much deeper than that. For example, on the descent from Minnewaska, there are three primary pitches, each ending with a slight uphill that act as runaway bike ramps to check your speed. On the run loop, there are three primary hills, three aid station stops, and obviously three stretches of trail between each aid station. The bike course also has three aid stations. But wait, it gets better. 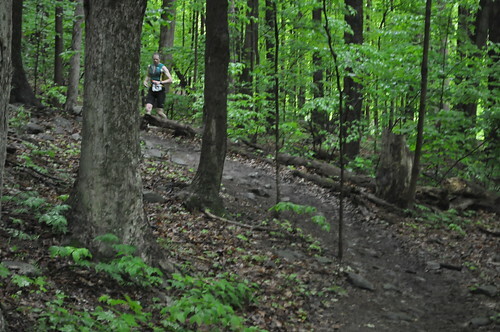 The second big hill on the run can be divided into three segments broken by two fallen trees you need to run around. And the third killer hill also has three pitches: the first short one leading up to the rock garden turn, a second one that ends with a little respite, and then the final massive pitch up to the climbing cliffs on the left. These are the kinds of things that occupy my mind while racing for eight hours. At least when I’m not focusing on the occasional pothole, bog, or slippery, downhill single track. It is the kind of thing that I think about to distract myself from the suffering, of which there was plenty on Sunday. The suffering this year began and ended with the weather. On Saturday evening, the forecast was for a mostly dry but cool day, with passing showers starting in the PM, by which time I’d be off the bike. Sunday morning, the forecast I saw changed to AM rain ending by 10AM or so, which is still pretty manageable. The reality was that I don’t think it got warmer than 55, at least not while I was on the bike, and it rained almost constantly. I decided to mirror what I wore two years ago: tri top, arm warmers, and a thin, tight, LS top. A picture of transition from 2011, but it looked just like this in 2013. My goal for this race was to beat my PR of 8:11, set back in 2008 when American Zofingen was still run in the Fall. I knew that was a stretch, but I printed out the necessary splits and taped them to my stem. My best Spring results were from 2010, when I ran 8:20 in near perfect weather. I ran 8:32 in 2011, in conditions that were probably worse than this year.. Last year we won’t talk about, but I got the race I deserved, given I didn’t even get on a bike between August and February and didn’t do much running between October and January. My training was as good or better than it has been for any Spring American Zofingen. I made all the usual trips to and over App Gap, but also ran more than usual, with five 20+ mile runs, all of which had some very significant hills and trails. I also spent a morning running and riding laps up Mt. Philo, which is the local quad buster. So I felt I was in pretty good shape. The race started off with a bunch of guys going off much faster than they should. My plan for this first lap was to push it a little more than I have in the past, but to keep things well under control. A bunch of people went out very fast, but I just watched them take off and out of sight over the first rise. I’d catch some of them and some of them I wouldn’t – I was running my race. I ended up running 41:44, which was 44 seconds behind my plan and very close to my time for the first run in 2008 and 2010. The course was much improved over past years, with miles of new gravel down on the carriage roads, and during this first lap the mud had not yet been churned into the greasy slime it would soon become. T1 was smooth and uneventful, at 1 minute. Well, except for that dumb decision to leave the long-sleeve on the ground next to my running shoes. I’d miss it later and headed out on the bike with only a tri top and arm warmers. This isn’t me, but it gives you an idea of the weather. From the top of Mohonk. I think there were about 6-7 of us who left T1 close together. Part of me wanted to get to the front of this group before we crested Mohonk, and I tested the waters for a little while but didn’t seem to make much progress, so I settled down into a steady pace, cresting the climb towards the back. I passed a few guys before and after the first nasty left turn, but then we all got caught up behind some cars. Nothing to do but sit up and ride the brakes. The first lap was pretty uneventful. One guy (not sure who, but he had lost his glasses on the dirt road and had two tubies strapped to a rear rack next to his bottles) and I played tag till the climb up Minnie, where I let him go. The first descent of Minnie wasn’t too bad. I’m pretty comfortable on this descent and stayed aero the whole way. I hit one good pothole on the third, steepest pitch and made sure I took it wide on the 2nd and 3rd laps down that stretch. Generally, the road was in pretty good shape. At the end of the first lap, I was right where I wanted to be, with a lap of about 1:40. I was cold on this first lap and would have liked another layer, but it didn’t feel necessary, yet. I felt pretty good the second time up Mohonk and was able to open it up on the way down. I was having a hard time seeing, since the rain stung my eyes if I looked over the top of my glasses but looking through them was pretty pointless. But I knew the road surface was pretty good so I just pointed the bike down and hoped no deer shot out in front of me. I was getting cold, but that descent is over before you know it. The same isn’t true of the descent down Minnie. The second time down I was getting cold, but I didn’t start to shiver till I took the sharp turn by the aid station. That was when I really started to get cold and my shivering was starting to impact my steering. As soon as I could, I downed a Hammer gel, and shot or two if Infinit Napalm, and a couple swigs of Infinit LD formula and some Heed. 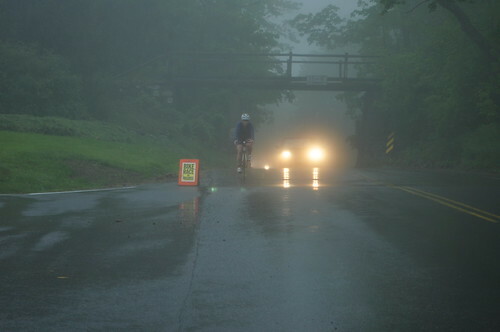 That helped, but I didn’t really start to warm up till the final climb up Mohonk. I think my time for the second lap was around 1:44 or 1:45, which was now about 5 minutes off of my goal 8:10 pace. Maybe I’d make it up on the run. I didn’t think I’d make it up on the next bike loop. The final lap felt better than the second lap. I had picked up some more Infinit LD formula at Special Needs. I also polished off my Napalm, two gels, one before finishing the Minnie climb (in hopes of warding off the shivers on the way down) and one towards the end of the loop to give me a boost on the run. Maybe things warmed up or maybe the fuel helped, but although I was cold, I never shivered and it definitely felt manageable. I came up on a few GCG riders on this loop. You could tell because of all the mud on their legs and backside. Total bike time was 5:11:42, which was 12 minutes behind my 8:10 pace. No problem, I knew 8:10 was a long stretch for me even in great weather conditions. T2 was slow. I put on dry shoes, put a few Hammer gels in my pockets, grabbed another flask of Napalm, and headed up to the Gazebo. This is where I need to make an apology. Somebody followed me out of T2 and it is to you I must apologize. (I’m the old geezer wearing the green and yellow GMBC top and black DeSoto shorts.) It wasn’t long after the Gazebo that I needed to release some gas. OK, maybe lots of gas. The footsteps I heard behind me soon faded. I’m not sorry for the chemical warfare, afterall I don’t believe there is anything in the rules about dispersing gas, but I do apologize for not looking back to even see if you were OK.
After leaving this poor gentleman behind in a haze, I started to get into a rhythm. I one of those nuts who don’t believe in walking anywhere on the American Zofingen course. Not that I’m a whole lot faster than those walking, but no matter how short my strides, I just feel better if I keep up that running rhythm. I think it also makes the transition to downhill stretches much easier. I won’t go into much detail about the run. (Actually, I don’t remember much!) I passed a bunch of people on the first lap, probably some GCG people in that mix, fewer on the second lap, and pretty much ran by myself on the last lap. (Which was nowhere near as pleasant as last year when I ran much of the time with Christine and I think Colin Martin.) The volunteers out at the mid-course aid station were great (they all were) and at one point put me back on course with a “Sir, I think you are supposed to go this way”, since I took that first turn by the aid station wide and missed the sharp left. Thanks, but “sir”? Some downhill singletrack towards the end of the run. Final laps were 47:40 (1: 20 better than planned), 49:12 (right on plan), and 52:16 (3+ min over plan). My finishing time was 8:25:37 and I have absolutely no complaints about that. Next year I age up! 55 to 59′ers look out! 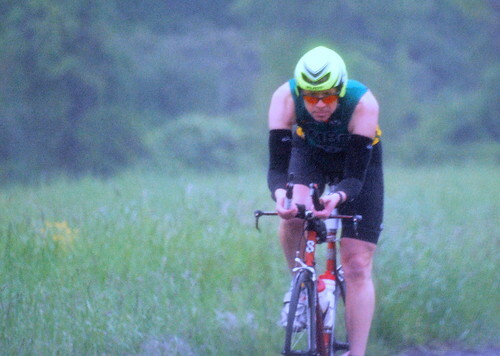 I hit the road as soon as I was able for the 4+ hour ride home and pulled into the driveway almost 20 hours after leaving, with equal amounts of time racing and driving. I got in an early ride up App Gap, complete with snow, sleet, slush, and lots of sand. I can still feel the grit between my teeth. Generally, it was a good ride and most of the suffering was due to the weather and note the grade. Coming down was tough because of the occasional patches if snow, polished or loose, mega amounts of sand, and some frost heaves that would launch you if you weren’t careful.